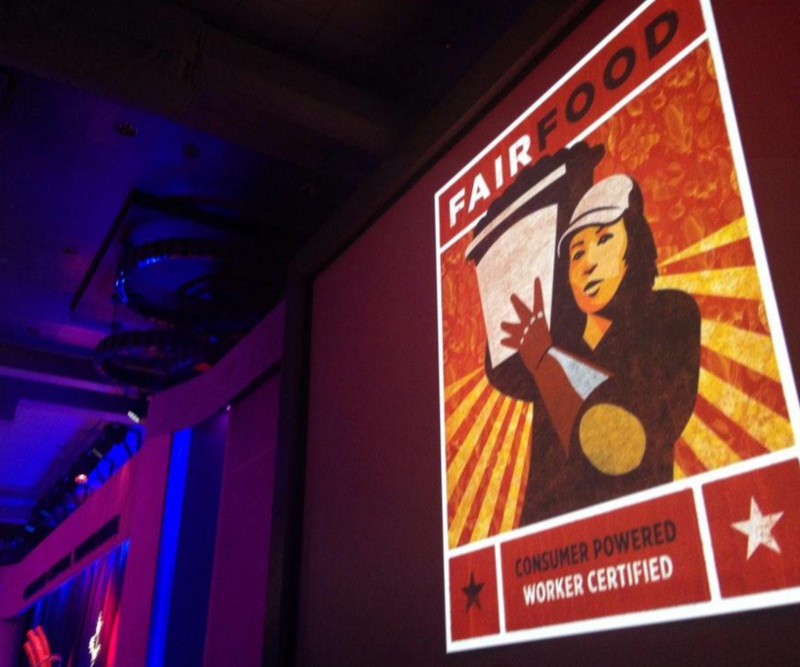 Part One: The Fair Food Nation makes the case for real human rights at Wendy’s annual shareholder meeting! 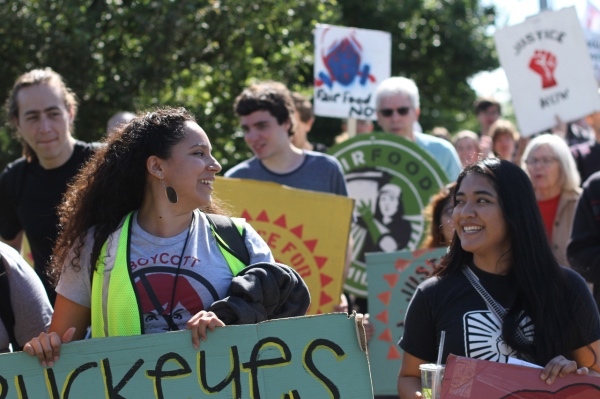 Twenty-seven farmworkers and Fair Food allies — totaling a majority of the shareholder attendees at the Wendy’s annual shareholder meeting — march out of the meeting room and out of Wendy’s headquarters on Tuesday in Dublin, Ohio. After eleven members of the Fair Food delegation managed to speak in support of real human rights protections for farmworkers in Wendy’s supply chain during the General Questions portion of the meeting, company executives cut off Q&A and the delegation rose as one, took out boycott logos, and exited the meeting together while holding them up for all to see. Remarkable drama unfolds both inside and outside of Wendy’s normally staid annual gathering as farmworker, student, faith, and community representatives of the Fair Food Nation take a stand for real human rights protections in fast-food giant’s produce supply chain! While Fair Food Nation representatives spoke inside the shareholders’ meeting of the urgent need for Worker-driven Social Responsibility for workers who pick Wendy’s produce, scores more consumers and workers lined the street outside the meeting in a colorful, animated protest. 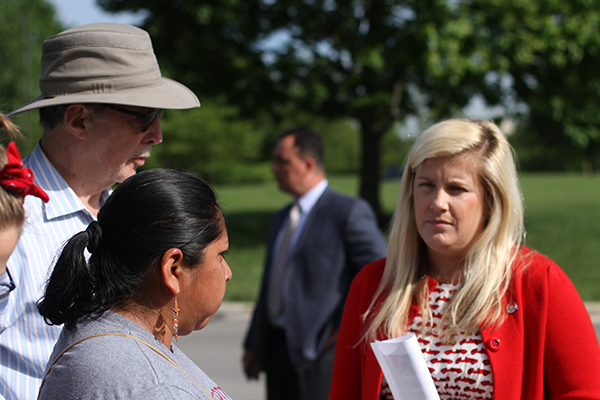 Today we bring you Part One of our two-part report from an extraordinary day of action at Wendy’s annual shareholder meeting this past Tuesday at the company’s corporate headquarters in Dublin, Ohio. 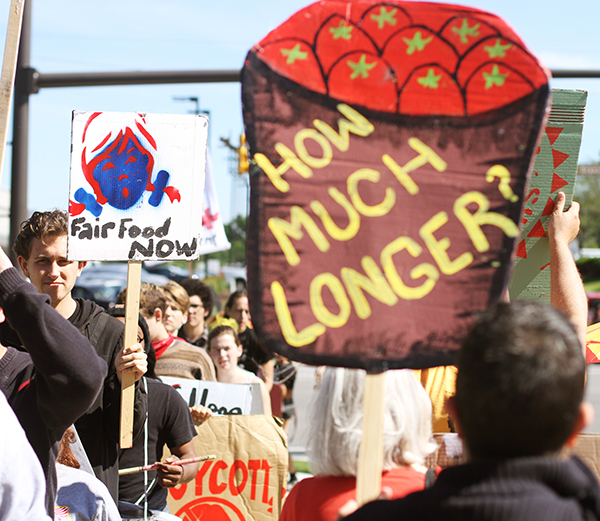 In Part One, we will relate the events of the day — from the wide-ranging debate inside the meeting to the spirited protest outside — with a first-hand report from the Alliance for Fair Food. In Part Two, we’ll take a closer look at the ever-deeper divide between Wendy’s vision of corporate-controlled supply chain management on the one hand, in which human rights take a back seat to profits in a zero-sum cost/benefit analysis; and the Fair Food Nation’s rising new paradigm of Worker-driven Social Responsibility on the other, in which workers, suppliers, and buyers work together to ensure fundamental human rights are respected at all levels of the supply chain, and real social responsibility is an investment in a more humane business model concordant with the demands of 21st century consumers. So pull up a chair and pour yourself a cup of coffee for a detailed report from Tuesday’s action below. Then check back again soon for more analysis from a most memorable day in Dublin. 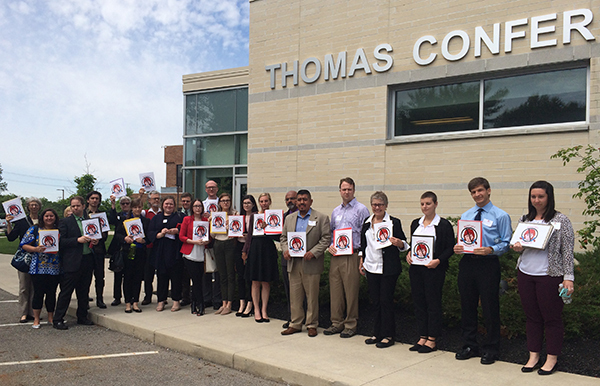 As shareholders and Wendy’s executives filed into the headquarters’ Thomas Conference Center for the annual shareholder meeting on Tuesday morning, a group of 27 Fair Food supporters streamed in alongside them: nationally-respected religious leaders hailing from the Presbyterian Church (U.S.A.), the United Church of Christ, the Unitarian Universalist Service Committee, several Catholic orders of women religious, the National Farm Worker Ministry, the Interfaith Center for Corporate Responsibility, and T’ruah: the Rabbinic Call for Human Rights; students from three Boot the Braids schools, Ohio State University, University of Michigan, and UNC Chapel Hill; several community, faith and student leaders from Columbus, Cleveland, Miami, Nashville, and other cities; and of course, the Coalition of Immokalee Workers. 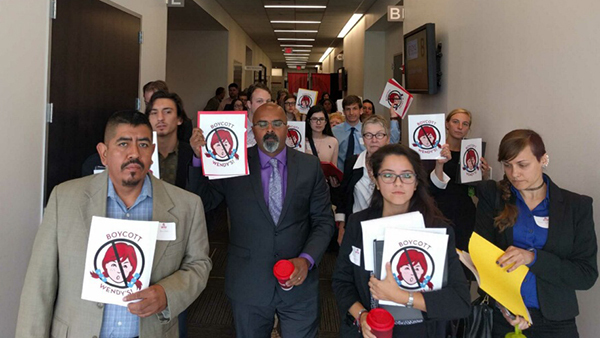 In an unprecedented level of turnout, this formidable group of farmworkers and allies – interspersed throughout the room with other shareholders – constituted over half of the shareholders present, their numbers a tangible reflection of the impatience of consumers with Wendy’s unconscionable decision to turn its back on the Fair Food Program. And when all was said and done, eleven of these representatives directed incisive questions to Wendy’s leadership during the final General Questions portion of the meeting, turning the topic of the Fair Food Program – and Wendy’s status as the final fast-food holdout from the award-winning program – into the dominant theme of the annual meeting. The Fair Food forces gather for a group picture outside Wendy’s headquarters following their intervention in the company’s annual meeting. The shareholder meeting began with a “business overview” presentation from Todd Penegor, President and CEO, which painted a rosy picture of Wendy’s capturing more and more “share of stomach,” resulting in an increased stock price, cash flow, and ultimately dividends for shareholders over the past few years. Mr. Penegor went on to present the “Wendy’s Way,” through which Wendy’s creates not only profits, but also “creates joy and opportunity through food, family, and community.” He was followed by Chief Communications Officer Liliana Esposito, who offered shareholders the anticipated “Corporate Social Responsibility” update. After thanking Mr. Penegor and Ms. Esposito “for those very clear messages,” Board Chairman Nelson Peltz asked that the lights be turned on for the General Questions portion of the meeting. And thus the stage was set for a truly remarkable show, as 11 of the 27 farmworkers and allies in the room approached the microphone one after another to deliver a series of razor sharp statements that would, thread by thread, unravel the cheerful tapestry of well-intentioned, successful social responsibility efforts that Wendy’s executives had labored so painstakingly to weave. 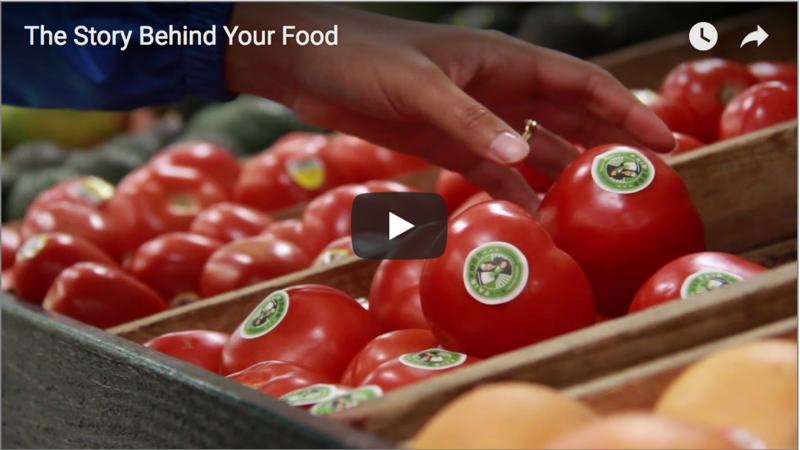 … This is the only effective way to ensure that the scourge of slavery and abuse in the food system is eliminated. Instead of joining this proven program, Wendy’s has moved its purchasing of tomatoes to Mexico… I did human rights work on the U.S. / Mexico border for 20 years, and here’s what I know: Escaping to Mexico to source your tomatoes does not relieve your moral quandary; it deepens it. The Los Angeles Times documented one farm where 200 workers, including children, were in forced labor. This is a farm where Wendy’s sources its tomatoes… Your refusal to join the Fair Food Program places you on the wrong side of history. So long as you choose to remain there, the faith community intends to work tirelessly with our ecumenical and interfaith partners to assure that this boycott will be effective. This movement has staying power within our churches. 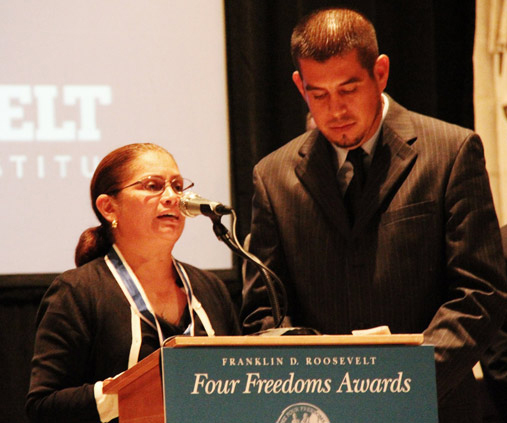 “I have been a farmworker since I was 17 years old. I have seen, up close, the two worlds – the one which we are coming from, and the one we’re in today thanks to the power of the corporations that are working together with us. Among them are Wendy’s principal competitors, including McDonald’s, Burger King, and Taco Bell. 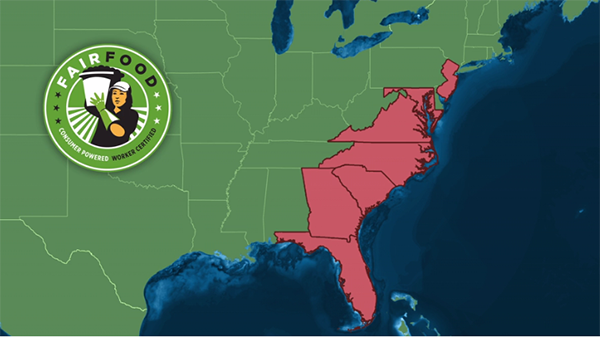 Thanks to this market power, we are now eliminating abuses that have been endemic in the U.S. agriculture industry. 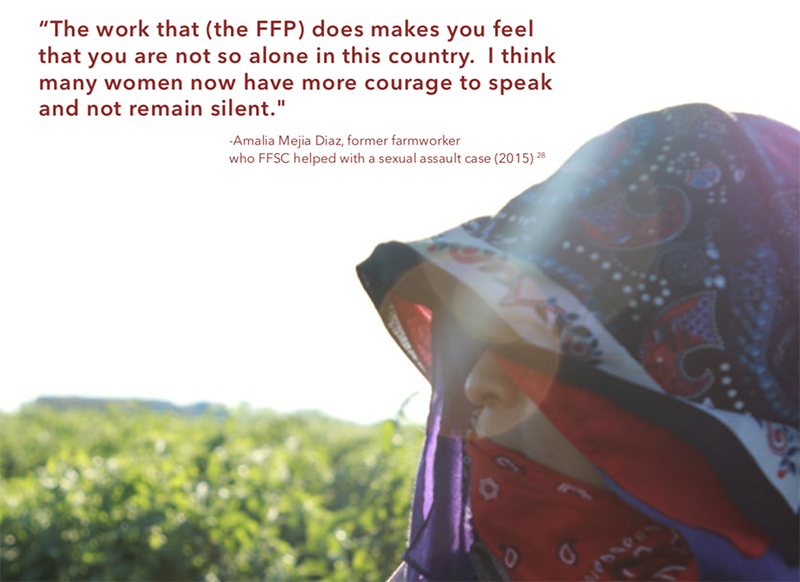 Forced labor, modern-day slavery, the sexual harassment that has been the bread of every day for the millions of farmworker women who labor in the fields. Board Chairman Nelson Peltz, instead of responding to a question directly from the farmworker community of Immokalee, or even bothering to reference the Code of Conduct, simply replied with “Thank you.” After a stiff moment of silence, Alliance for Fair Food’s Patricia Cipollitti came in after Lucas, and directly refuted the false claim from Liliana Esposito that the CIW receives “fees” from participating buyers. Patricia pointed out that – as stated countless times publicly by Judge Laura Safer Espinoza of the Fair Food Standards Council, among others – the “penny per pound” Fair Food premium never even passes through the CIW, but rather is paid to growers through regular purchasing channels and is then distributed to workers through regular payroll channels, all in a process carefully and painstakingly monitored by the Fair Food Standards Council. Increasingly agitated, and clearly concerned about losing control of the annual meeting’s agenda, Nelson Peltz adjourned the meeting. Even as the drama was unfolding inside the Thomas Conference Center, over 60 allies gathered outside of the flagship Wendy’s across the street from the headquarters at 8 am, a sunny summer morning greeting those who began to arrive from as far as Michigan, Tennessee, Kentucky, Pennsylvania. Ahead of the meeting, the crowd of protesters, arms filled with artwork, was warmed up with a welcome from Lucas Benitez as he prepared to enter the meeting. He was joined by Rick Ufford-Chase, former moderator of the Presbyterian Church (USA) and Henry Anton Peller of the Ohio State Student/Farmworker Alliance and Real Food OSU, one of the 19 OSU students and alumni who precipitated two months of rolling student fasts around the country with a 7-day fast at OSU in March. Rick Ufford-Chase: “…I’m here today because thirteen years ago, when I was serving as the Moderator of the Presbyterian Church (USA), I made my first trip to Immokalee. I met Lucas and others, met with workers there and heard their stories, and we joined the Taco Bell Boycott… I was in a church in New Orleans when I was buttonholed after I preached on this issue by four men in business suits who explained to me that it was impossible for Taco Bell to ever do what we were asking for, and we were unbelievably naïve to think that Taco Bell could do it, and we were going to learn our lesson. Good morning, my name is Henry, and that is the message I have to bring to Wendy’s today; that is, to remind them of the power we are building across the country and that is waiting for them at every turn, with every piece of PR they put out, we will demand they join the Fair Food Program … As Mr. Brolick will remember, in the midst of a four year national boycott, 25 institutions terminated their contracts with Taco Bell in support of the Fair Food Program. History will repeat itself! Today we are joined by students at the University of Michigan, the University of North Carolina — Chapel Hill, and Vanderbilt University. We are united in our determination to cut contracts with Wendy’s. 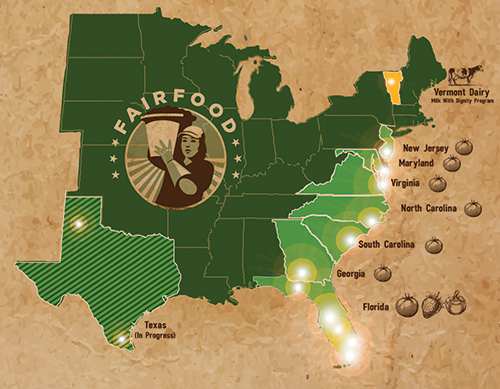 One of these universities will soon be the first to stand with the Fair Food Program and blaze the trail for dozens to follow. The crowd then erupted into a lively picket, accompanied by a drum team from Michigan and chants of “We are unstoppable! Another world is possible!” “We ain’t buying what they’re selling, the people are rebelling, boycott Wendy’s! Boycott now!” After just a short while of picketing, the CIW and allies were surprised to be invited to speak with Heidi Schauer (below, right), Wendy’s Director of Corporate Communications, to discuss with Wendy’s why the group was gathered outside the company’s national offices. … A number of major food companies, including Burger King, McDonald’s, Yum Brands (Taco Bell), Whole Foods, Trader Joe’s and Wal-Mart have signed on. 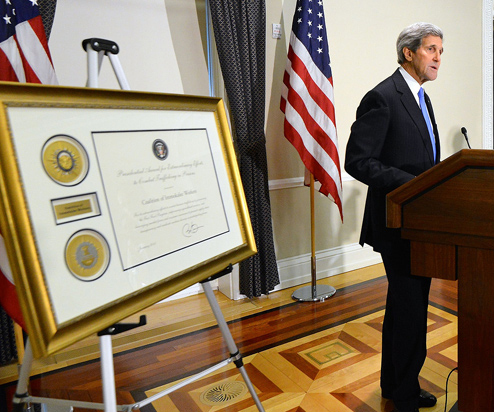 The program has been lauded by the United Nations, an advisory council to President Barack Obama, The Washington Post, The New York Times and PBS. 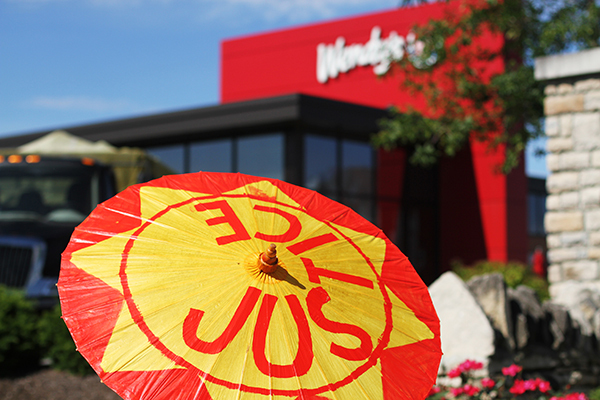 Lupe Gonzalo of the CIW took Wendy’s up on the opportunity. 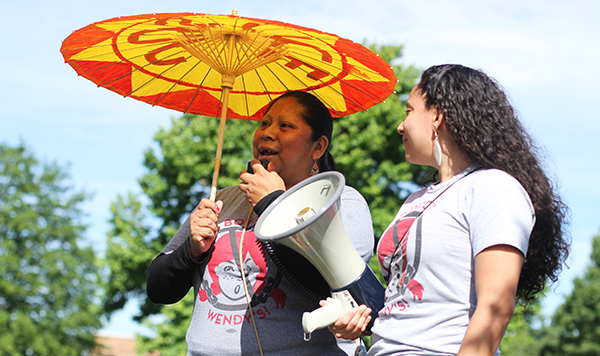 After extending an invitation to Wendy’s to join farmworkers, growers, and 14 of their buyer peers in the Fair Food Program, Lupe contrasted the Fair Food Program with Wendy’s supplier Code of Conduct, pointing out that Wendy’s current approach to social responsibility lacks any effective enforcement mechanisms or worker participation. Perhaps regretting her offer to meet, Ms. Schauer quickly cut off other customers who had also gathered to express their concerns, and explained that CIW and AFF representatives who had entered the meeting would hear directly from Liliana Esposito, Wendy’s Chief Communications Officer, as to the fast-food company’s response to the ongoing demand for Wendy’s to join the FFP. Then she left. Meanwhile, the picket continued for another hour of animated protest. 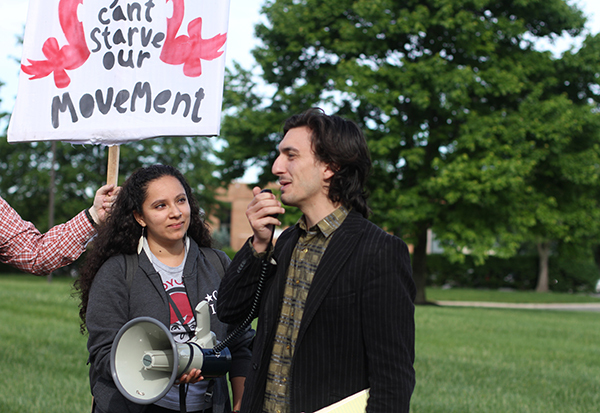 Following the picket, the protesters gathered to share their various connections to the CIW and their community’s commitment to the Wendy’s Boycott. The group — including representatives from worker-led struggles around the region against exploitation, displacement, and police brutality — shared their commitment to bringing the Wendy’s Boycott to their communities and supporting one another in their respective struggles for justice. 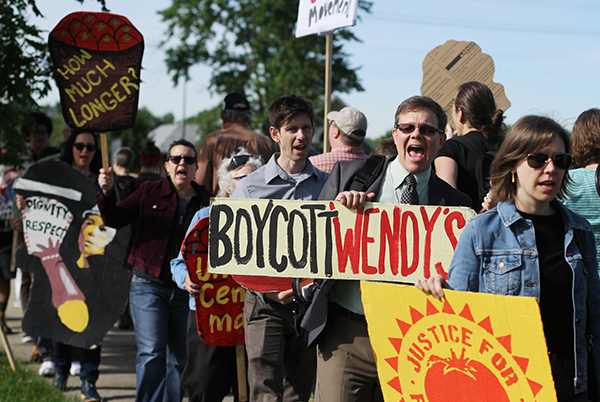 REMINDER: Join the mobilization for the Wendy’s Shareholder Meeting next week!